Archduke’s dying words imploring wife to “Stay alive for the children"
On 28 June 1914, Archduke Franz Ferdinand, heir to the Austro-Hungarian Empire, visited Sarajevo. What happened in the city that day would set in motion a series of events that would lead the world to war. One hundred years later, BBC News revisits this critical day, as it happened. The royal visit is one of the most significant tours by the heir to the Austro-Hungarian Empire. He has been accompanied on the tour by his wife, Duchess Sophie of Hohenberg. The archduke has spent the last two days with the military while Sophie has visited schools, orphanages and churches in Sarajevo. Today's drive through Sarajevo is expected to be the highlight of this visit. The couple have been staying at the luxurious Hotel Bosna in Ilidza, six miles (10km) west of Sarajevo, during the official visit. They are currently on board a train to Sarajevo, expected to arrive at 09:50. Last night the couple dined at a special banquet with 41 guests, including Bosnia's top military, religious and civil officials. The archduke is a seasoned traveller and has visited some of the furthest-flung corners of the globe, taking in Australia, New Zealand, China, Japan, Canada and the U.S. on a world tour in 1893. He last visited Britain in November last year. The archduke and Sophie stayed with the King and Queen at Windsor and visited Sherwood Forest and Bolsover Castle during the visit. It was reported that the archduke is now "an appreciator of all things English". Sarajevo last saw a royal visit in 1910 when the Emperor Franz Joseph visited the city, two years after Bosnia had controversially become part of the Austro-Hungarian Empire. The emperor, 83, is one of Europe's longest reigning monarchs, having ascended to the throne in 1848. In recent months he has been suffering from illness. A health scare in April has increased speculation about Franz Ferdinand becoming emperor in the near future. So this visit by his heir is aimed at strengthening the royal relationship with Bosnia. VIDEO: Royal correspondent Nicholas Witchell profiles the heir to one of Europe's oldest royal dynasties. Watch the full report in the key video tab above. The archduke struck a chord with the public in 1900 when he chose love over duty by marrying a lady-in-waiting, Countess Sophie Chotek. The story of their marriage was front page news in Austria. As a member of the royal House of Hapsburg-Lorraine, he had been expected to choose a bride from a royal or princely family. His marriage to Sophie was finally permitted only on the condition that their children are barred from the Austro-Hungarian succession. Sophie carries the title of Duchess but is denied certain privileges given to others of her rank. At home in Vienna, she is not allowed to ride in the royal carriage or sit in the royal box. But as the archduke is visiting Sarajevo in his military capacity as Inspector General of the Armed Forces, Sophie will be riding alongside her husband during today's procession. Today is also the day the couple celebrate their 14th wedding anniversary. VIDEO: Royal correspondent Nicholas Witchell on the royal couple's marriage. Another anniversary is also being marked in the local region today - the feast day of St Vitus. For Bosnian Serbs, who make up 40% of the country's population, 28 June is a day of national commemoration. It marks the anniversary of the great Serb defeat to the Turks at the Battle of Kosovo in 1389. It is also celebrated for the legendary bravery shown by the Serbian soldiers in battle. Sarajevo is sometimes called the 'Jerusalem of Europe' because it is home to three very distinct ethnic groups in Bosnian society. VIDEO: Special correspondent Allan Little reports from Sarajevo on the significance of today's visit to the Bosnian capital. Crowds are now lining the streets in their hundreds along the main procession route, which has been decorated with flags and flowers. The train is now pulling into Sarajevo station where the party will be met by General Oskar Potiorek, Military Governor of Bosnia-Herzegovina, and Sarajevo's Mayor Fehim Effendi Curcic. The archduke and duchess have now stepped out into the warm Sarajevo sunshine and are being greeted by dignitaries. The archduke is dressed in the uniform of a general of the Hussars, wearing a blue tunic and a black helmet with distinctive green peacock feathers. Duchess Sophie is wearing a white dress with a bright red sash, a fur of ermine tails and a wide-brimmed hat. The couple have been greeted by a ceremonial guard of honour and the band of the 15th Army Corps has performed the Austrian national anthem. The first stop on today's tour is a visit to City Hall for the official welcoming speeches with Mayor Curcic. Afterwards the archduke will be attending an event at the National Museum before re-joining the duchess at the governor's residence for lunch. They are paying a brief visit to the military barracks opposite the station, where the archduke will inspect the troops. The couple have got into an open-top car with their escorts General Potiorek and Count Franz von Harrach. The imperial flag flies on the bonnet. The motorcade is proceeding through the city, along Appel Quay, on the northern bank of the River Miljacka. Cannons from the old Turkish fortress to the east of the city boom out a 24-gun-salute to announce the start of the tour. Some people are shouting "Zivio" ("Long may he live") as the archduke and Sophie's car passes the crowds lining the street. The visit has been publicised in local newspapers to encourage a good turn-out for the final day of the royal tour to the region. The imperial motorcade is travelling along Appel Quay towards City Hall, built in 1896. The cars, 50 yards apart, pass by houses decorated with flags - Hapsburg black and yellow and Bosnian red and yellow. Most of the crowds are on the city side of Appel Quay, seeking shade. The archduke's car has passed the central police station and the new army barracks. BREAKING NEWS: There has been an explosion near the archduke's motorcade. It's not clear what caused it. Witnesses say there was a loud bang and the archduke's car moved off quickly. There is no word on any casualties. The cars following the archduke have stopped. One of the cars appears to have been damaged. Police are amongst the crowd. the scene is extremely confused. There is smoke and debris. Unconfirmed reports are coming through of injuries in the official party and in the crowd. The archduke's car has stopped. Officials are briefing the archduke on the incident. It now appears the explosion was caused by a bomb thrown from the crowd on the river side of the Appel Quay. Images are coming in from the scene of the incident. The archduke and Sophie are still in the car and have sent their aide Count Franz von Harrach to inspect the scene. A map showing the site of the suspected explosion. BREAKING NEWS: Reports indicate that up to 20 people have been injured in the explosion. Two military officers and a woman in the imperial party have been injured. It's not thought to be the duchess. UPDATE: Eyewitnesses report seeing a man throw a bomb at the archduke's car. They say the archduke himself deflected it from his own vehicle into the path of the car travelling behind. Unconfirmed reports are suggesting a man has been arrested in connection with the bomb incident. He appears to have tried to jump from the embankment in an attempt to escape the scene. UPDATE: Duchess Sophie is now thought to have sustained some sort of injury during the incident. Reports suggest she has a graze to her cheek caused by debris from the explosion. She is not thought to be seriously injured. The archduke is reported to be completely unharmed. It is understood Archduke Franz Ferdinand and Duchess Sophie are to continue the tour as planned. The archduke has been overheard dismissing the incident: "The fellow is insane. Let us proceed with the programme," he said. The archduke and Sophie have just arrived at City Hall. Preparing to greet the couple are dignitaries from Sarajevo's Christian, Muslim and Jewish leaders. The archduke is expected to take part in a welcoming ceremony while Sophie is due to meet the wives of Muslim officials. Mayor Curcic arrived slightly ahead of the archduke as he was travelling in the vehicle in front of the royal car. He is now waiting to formally greet the couple to the ceremony. UPDATE: Police at the scene of the bombing have made several arrests. It is not known if any of them are the man who threw the bomb. One of the injured officers at the bomb scene, named as Colonel Erich von Merizzi, has been taken to the garrison hospital. Army surgeons have arrived at the scene of the bomb attack. Police have started to clear the area. LATEST VIDEO: Allan Little reports on the events at City Hall. The archduke is meeting dignitaries after making a speech at City Hall. A few minutes ago he interrupted the Mayor of Sarajevo's welcome, saying: "I come to Sarajevo and am greeted with bombs! It is outrageous!" VIDEO: Security correspondent Frank Gardner reports from the Serbian embassy on the security challenges of the archduke's visit. BREAKING NEWS: Police say they have arrested a man in connection with the attack on the archduke. The suspect has been named as Nedeljko Cabrinovic, 19, a Bosnian Serb. He is being held at the police station. A picture of the suspect has been released. The event at City Hall is drawing to a close and the couple are leaving. The next stop on the tour is the National Museum. Officials have announced a change to the archduke's programme. He and his wife will go to the garrison hospital to visit the injured, including Colonel Merizzi. The motorcade has now left City Hall travelling at high speed. Extra security measures appear to have been put in place. An army officer has been stationed on the car's running board to shield the archduke. BREAKING NEWS: Reports of shots fired near Lateiner Bridge, 300 metres from City Hall. Archduke Ferdinand has been shot, say reports. More to follow. The shooting happened on the corner of Appel Quay and Franz Josef Street. The archduke's car is reported to have sped across Lateiner Bridge. The archduke's condition is not known. Police are arriving at the scene of the shooting. Violence is breaking out in parts of the crowd. LATEST VIDEO: Allan Little reports from the scene of the shooting. Police have stopped the crowd attacking a young man. A man has been arrested. People in the crowd claim he shot the archduke. It is not known whether he is linked with the attack or the bomb incident earlier. Eyewitnesses say the archduke's car was attempting to turn after taking a wrong turning. The gunman was seen stepping forward and firing two shots at close range. Eyewitnesses say the archduke was sitting upright while his wife slumped forward. Officials have confirmed that the archduke and his wife have been taken to the Konak, the official residence of Governor Oskar Potiorek. There is still no word about their condition. The Konak, where the archduke and duchess are currently being treated by medical staff. Two priests have been seen going into the Konak. Bells are beginning to toll across Sarajevo. Archduke Franz Ferdinand and his wife Sophie have died from gunshot wounds, an official has confirmed. LATEST VIDEO: Allan Little is outside the Konak, the governor's residence. Archduke Franz Ferdinand (1863 - 1914) and Sophie, Duchess of Hohenberg (1868 - 1914) leave three children, Sophie, Max and Ernst. The suspect arrested in the earlier bomb attack, Cabrinovic, has told police that the bomb was acquired from an unspecified "organisation". He has refused to give any further details or reveal whether he was part of a coordinated assassination plot. Police have named the suspect as Gavrilo Princip. It is not known if the two attacks are linked. A police officer is reported to have been injured during the arrest of Princip. An eyewitness, Danilo Pusili, was standing near the archduke's car at the time of the shooting. Pusili claims to have grabbed hold of the assassin's collar in the aftermath, saying: "I thought of strangling him, but then, I thought of my Eternal Judge, and rejected the temptation". A spectator who was a guest at City Hall earlier described the archduke as striding boldly into the building, but that he seemed "strange", adding, "I suppose he was trying to show that he was not afraid". Questions will surely be asked about the security operations for today's trip. When Emperor Franz Joseph visited Sarajevo in 1910, security is reported to have been much tighter than during today's visit. Soldiers lined the route and all newcomers to the city had to register within six hours of their arrival. This photo of the royal couple has emerged, taken moments before the fatal shooting. We have just heard from the Archduke's aide, Count Frank Harrach, who was standing beside the archduke when the attack took place. He has revealed details of the archduke and Sophie's final moments. After the shots were fired, Harrach describes seeing "a thin stream of blood spurt from His Highness's mouth onto my right cheek". As Harrach went to the archduke's assistance, the duchess appears to have cried out, "What has happened to you?" before sinking down in her seat with her face between her knees. "I had no idea that she was hit and thought she had simply fainted with fright. Then I heard His Imperial Highness say, 'Sopherl, Sopherl, don't die. Stay alive for the children!'" "His face began to twist somewhat but he went on repeating, six or seven times, ever more faintly as he gradually lost consciousness, 'It's nothing!' Then, after a short pause, there was a violent choking sound caused by the bleeding. It was stopped as we reached the Konak." The bodies of the archduke and duchess will remain for the time being at the Konak. There are no further details at this stage. Flags are being lowered to half mast across the city. News of the Archduke's death spreads across Europe during the afternoon. The Kaiser and the the assassinated Austrian heir Franz Ferdinand were close personal friends. Much depends on the way the Austrians see fit to investigate the killing in Sarajevo and if they desire to lay the blame on the Serbs. St Petersburg correspondent Oleg Boldyrev. The death of the archduke is battling for space on the front pages of the French newspapers this morning with the other big story of the day. Wild rumours and conspiracy theories are spreading about who may have been behind the murders - was it an inside job? 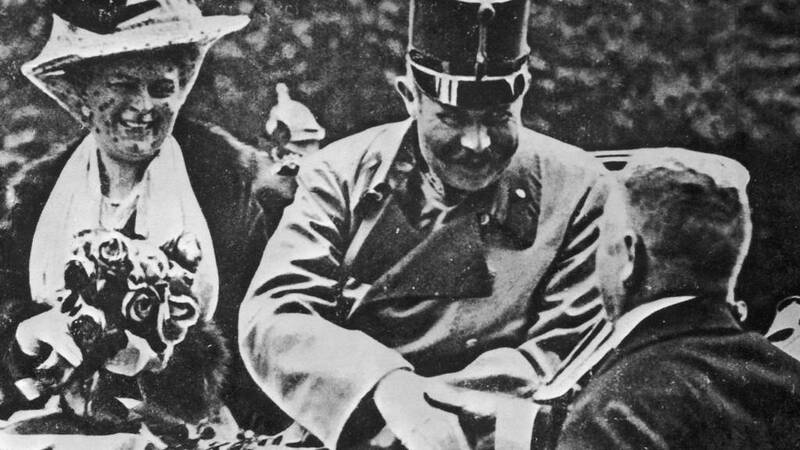 Germany has been flexing its muscles of late and President Poincare will fear that the Kaiser might seek to exploit an extremely dangerous situation. In Sarajevo, riots break out in the evening. By early afternoon on Monday 29 June, mobs destroy Serb shops, schools, clubs and houses, as well as demolishing the offices of two Serb newspapers and the city's best hotel, Europa. One man is killed and 50 injured, some severely. Troops and police clear the streets by late afternoon. The Governor declares martial law at 4pm, with strict curfews and restrictions on numbers. Punishments range from prison sentences to death. Newspaper front pages have been pinned up on walls and crowds of people are gathering around them. Flags are flying at half mast. Watch the full report on the Key Video tab above. The timing is all the more odd when you consider how sympathetic Franz Ferdinand was, in general. Here at the Foreign Office in London there has been dismay at the assassination in Sarajevo. The funeral of Archduke Ferdinand and Duchess Sophie took place in Vienna on Friday 3 July 1914. Royal households across Europe ordered periods of official mourning. However, no foreign representatives were invited to the funeral. Sophie's coffin was set half a metre lower than her husband's. In a further snub, the couple's children were excluded from the service, deemed unworthy to share a church with the Imperial Household. As the bodies were moved from the chapel to be taken on the journey to their burial place, hundreds of aristocrats spontaneously joined the procession to the train station, walking behind the coffins in an act of open defiance of the couple's treatment. Archduke Ferdinand and Duchess Sophie were buried after a second, low-key ceremony at Artstetten, 60 miles west of Vienna, in identical white marble tombs, created at the insistence of the archduke so they could be buried together when they died. Nine men had set out to kill the archduke that day. Only two made an attempt on his life, Nedjelko Cabrinovic and Gavrilo Princip. Both were immediately arrested and, under questioning, eventually gave up the names of their co-conspirators. Tried for treason and murder, eight were found guilty (one remianing conspirator escaped to Serbia before the trial) and three of the men were executed. Princip and Cabrinovic were too young to face death under Austro-Hungarian law and received the maximum term possible of 20 years imprisonment. They would not see the end of the war their actions triggered. Cabrinovic died in prison from tuberculosis in January 1916, 13 days before his 21st birthday. Princip died on 28 April 1918, also of tuberculosis. Just teenagers on the day of the attack, Princip and Cabrinovic were members of Young Bosnia, a loosely coordinated group of Serb nationalists made up mainly of high school students. Supplying and aiding the assassination plot was the Black Hand, an extensive and well-orchestrated organisation with connections to the top ranks of the Serbian military. The world did not know it, but the fault lines of Europe had started to show. Princip's bullet had lodged at the heart of Europe's precarious peace. Within 37 days, the most powerful and far-reaching empires of the age would be engaged in the first truly global conflict. What happened to lead the world to war? 37 days timeline: Follow a timeline of the events that led to war in 1914. How close did the world come to peace in 1914? : Professor Margaret MacMillan looks at the accidents of history in summer 1914. Radio 4 series, 16:55 daily to 8 August: Professor Margaret MacMillan follows the news, as it happened across the world, on the road to war.